After unlocking the vehicle using the remote control or the key, pull the door handle. 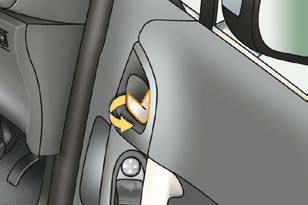 Pull on the front door control to open the door; this unlocks the vehicle completely. 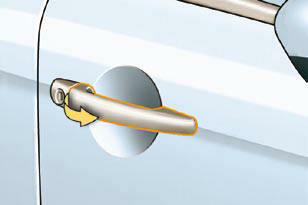 Pull on the rear door control to open the door; this unlocks the door concerned only. - when the vehicle is moving (speed higher than 6 mph (10 km/h)), this warning lamp comes on, accompanied by an audible signal and a message on the multifunction screen for a few seconds. Press button A to lock the vehicle. The red indicator lamp on the button comes on. If one of the doors is open, central locking from the inside does not take place. Press button A again to unlock the vehicle. The red indicator lamp on the button switches off. 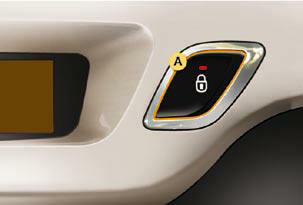 If the vehicle is locked from the outside, the red indicator lamp fl ashes and button A is inactive. In this case, use the remote control or the key to unlock the vehicle. 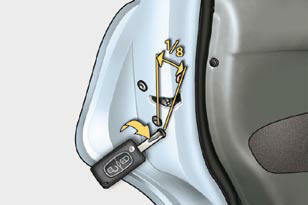 System which provides full automatic locking or unlocking of the doors and the boot while driving. 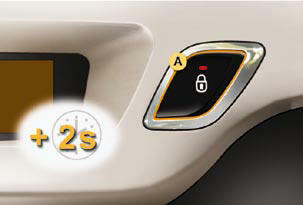 When the speed exceeds 6 mph (10 km/h), the doors and the boot lock automatically. Above 6 mph (10 km/h), press button A to unlock the doors and the boot temporarily. Press button A for more than two seconds. A confi rmation message appears on the multifunction screen, accompanied by an audible signal. Press button A again for more than two seconds.